I started working as the coordinator for the Grandview Woodland Food Connection in August 2008, the year of the latest economic meltdown. Severe food shortages hit many poorer countries and the media was awash in terrible stories of food riots in these countries. I doubt global food distribution has improved in the past 4 years, but 2013 stands out for me as the year that dignified food access became a central discussion point within the food security movement locally and nationally. Van Jones, American environmental advocate of green jobs, said something to the effect that we will not achieve sustainability without equity… that as long as families remain in poverty, their ability to access healthy local organic food is out of reach. These families will continue to shop for the cheapest, usually lowest quality food at places like Walmart. Environmental sustainability cannot come at the expense of socio-economic inequity and likewise we cannot talk about a local food system without talking about the many dimensions of food access. 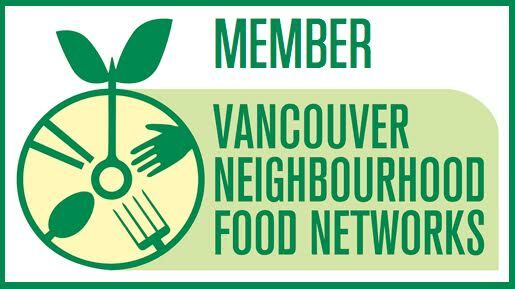 The release of the 2013 Vancouver Food Strategy is helping to provide a comprehensive framework towards the development of a more ecological and just food system, meaning that everyone, no matter what their economic means should have access to good healthy sustainably produced food. Emphasizing food access is a key objective in achieving food justice. Important new food centres are opening up across Canada with their central attention on food equity. Olivier de Schutter’s, the UN Special Rapporteur on the Right to Food, scathing 2012 report on Canadian food security, in particular lack of food access by First Nation’s communities thrust the issue into our national consciousness. Among the many food discussions that I am hearing, food access and equity feature prominently as we work to better understand the many complex aspects of a secure and local food system. The Grandview Woodland Food Connection has always worked on the premise that everyone has the right to affordable, healthy, sustainably produced, and culturally appropriate food. We feel that food can support many human dimensions including nutritional sustenance, emotional and spiritual well-being, cultural identity, and community or social connection. Our food festivals, community kitchens, school and community gardening projects, bulk buy groups and more all assert food equity and the power of food to help nourish each of us in many ways. 1. 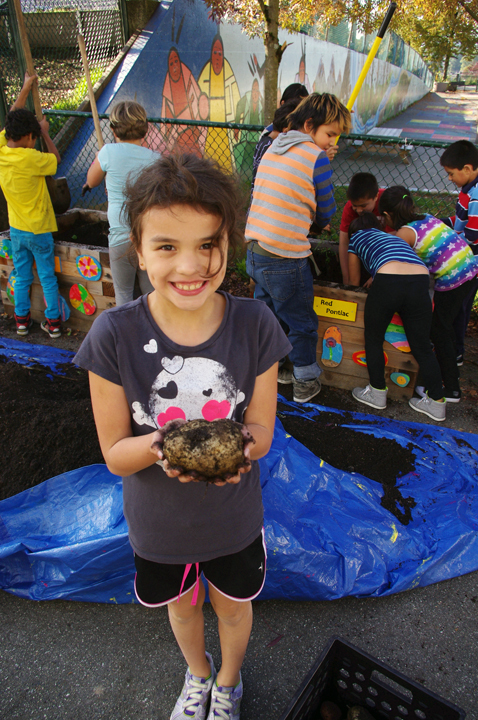 The Great Potato Harvest – The Britannia Grade 4’s got to dig up potatoes that they had planted that previous spring. It was an afternoon of pure fun and joy for the children as they dug up potato after potato, screaming with delight as if they found the most amazing treasure. I decided that I love working with this age group that is so curious and interested in gardening. 2. Raiding the Garden for Peas – Our snow peas were abundant this year in the Britannia School Garden. I brought a group of Grade 3s to the garden and let them go wild picking snow peas. The kids were running around having so much fun picking veggies. They all took home a baggie full of peas. 3. The Great Salad Harvest – And yet another garden highlight. Our newest community garden project Le Chou at the Woodland Park Community Garden was created to bring youth and seniors together to share and learn about gardening. 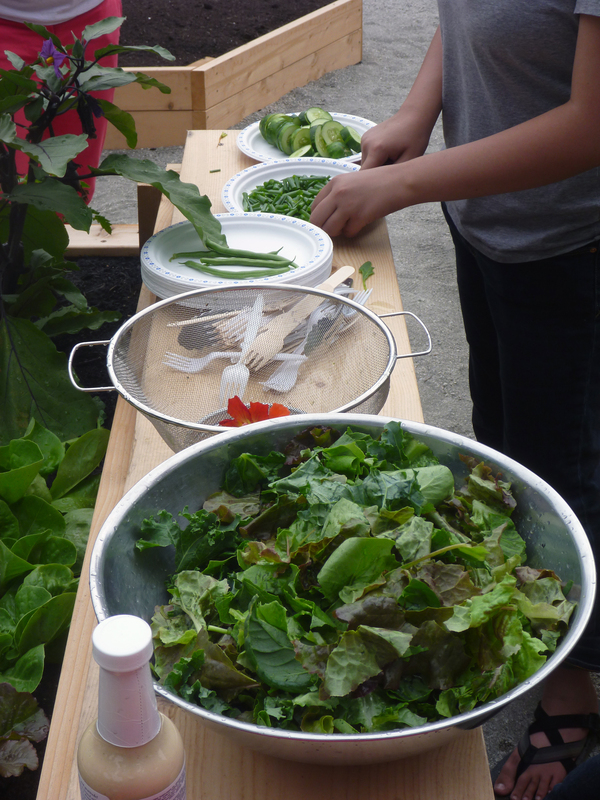 One day, mid summer, we brought a large group of summer camps kids to the garden, which was abundant with veggies. The kids all picked a huge variety of fresh veggies, we made an enormous salad and ate the most heavenly, delicious, freshest salad ever. 4. Britannia School Garden – SEGA Girls School Garden Twinning – The Britannia garden is named Nexway̓s wa lh7áy̓nexw or transformed life in Coast Salish. Through a partnership with Slow Food Vancouver, we twinned with a school garden in Tanzania. In a successful film fundraiser this past year, we were able to send over $800 to the SEGA School garden to be used for organic gardening training. 5. Corn Festival – This festival held at Britannia is always a lot of fun. 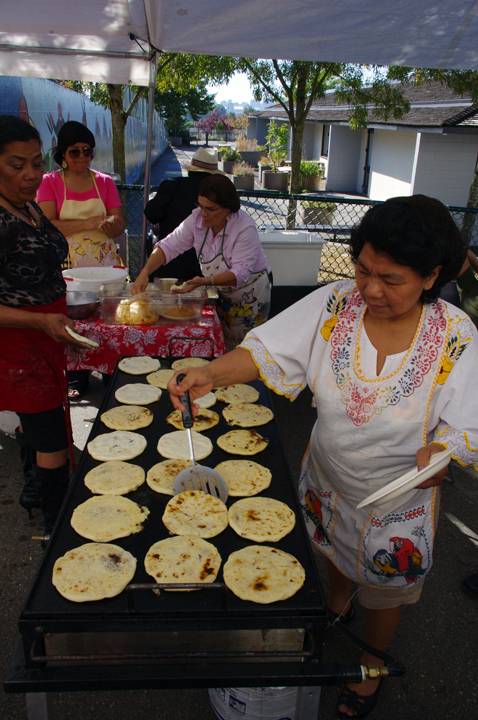 With all the tasty Latin American food – tamales, pupusas, paletas and lots more, plus al the dance and music who wouldn’t love a little slice of Latin America in East Van. 6. Dignified Food Access Research – Many Food Bank users are not connected to community food programs. 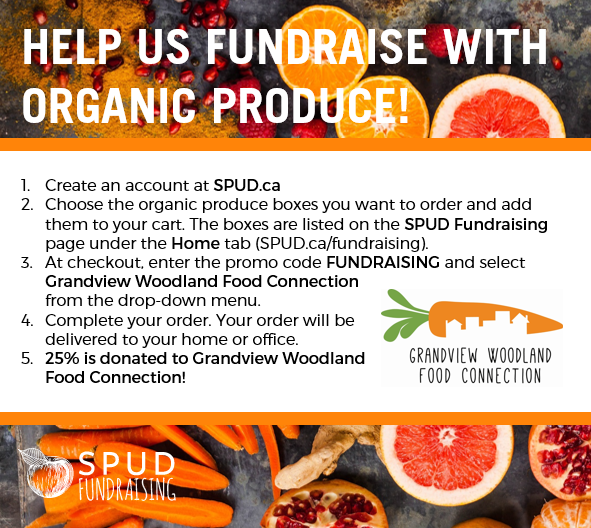 The Grandview Woodland Food Connection teamed up with SPARC BC to explore barriers to accessing community food resources. This was a great opportunity for some consultation and reflection and the findings will provide us some new direction this coming year as we continue to find new ways of connecting with the hardest to reach. 7. 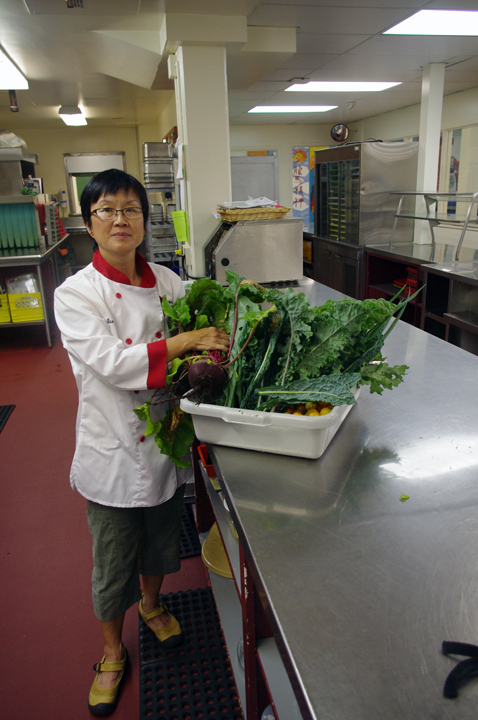 Fresh School Cafeteria Veggies – I can’t forget to mention how satisfying it is to be able to bring a load of fresh grown school veggies to the school cafeteria. This year saw us provide more food then ever as the school garden soil begins to improve and support increased plant growth. 8. Off the Grill – This highly collaborative project has brought together a number of youth service providers to provide a meal program as a means to connect with “at-risk” youth in our community. Off the Grill is providing super healthy dinners 3 days a week, which in the summer was held outdoors at the Britannia Community Centre and brought together youth and community members in a communal dinner format. The kids love it, eat healthy food and are building positive relations with others in the community. 9. SOYL – The Sustainable Opportunities for Youth Leadership, a UBC Think and Eat Green summer gardening internship continues to be a success with more schools and more students involved each year. His year saw a Britannia student register for the second year in a row, an example of how much some kids love gardening. 10. Britannia Bulk Buy – Our group grew to 32 households this year and providing fresh fruits and veggies for up to 47% discounts saving families lots of money on healthy food. This is a really great list of accomplishments. Congratulations and keep up all of your hard work Ian! Best wishes for 2014. I really appreciate the response. And I hope that your work is going well too.